Controlling and animating the facial expression of a computer-generated 3D character is a difficult problem because the face has many degrees of freedom while most available input devices have few. In this paper, we show that a rich set of lifelike facial actions can be created from a preprocessed motion capture database and that a user can control these actions by acting out the desired motions in front of a video camera. We develop a real-time facial tracking system to extract a small set of animation control parameters from video. Because of the nature of video data, these parameters may be noisy, low-resolution, and contain errors. The system uses the knowledge embedded in motion capture data to translate these low-quality 2D animation control signals into high-quality 3D facial expressions. To adapt the synthesized motion to a new character model, we introduce an efficient expression retargeting technique whose run-time computation is constant independent of the complexity of the character model. We demonstrate the power of this approach through two users who control and animate a wide range of 3D facial expressions of different avatars. Jinxiang Chai, Jing Xiao, Jessica K. Hodgins (2003). 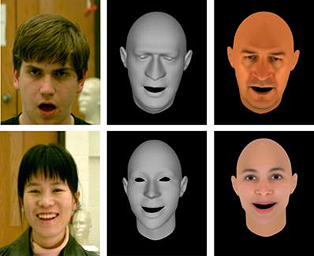 Vision-based Control of 3D Facial Animation. ACM SIGGRAPH / Eurographics Symposium on Computer Animation.